Sir MV is considered the “Father of Modern Mysore State”. As the Diwan of Mysore, he built a number of dams including the MV dam in Melinajuganahalli. It once was a beautiful sight but today is a dirty, foul-smelling spot. Sri. 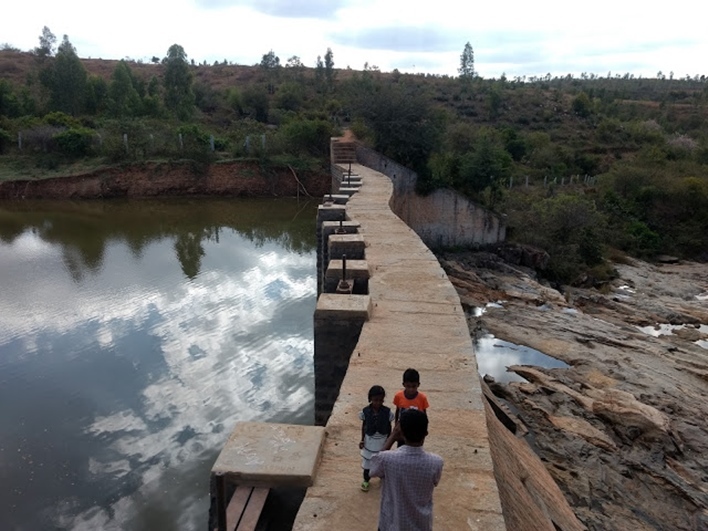 M Visvesvaraya Dam.Image courtesy thinkbangalore. Riversides, lakes, and dams have always been popular picnic places. Their picturesque beauty gives respite from the city’s concrete jungle; the air smells fresher and the sound of water flowing by calms the senses. But, we don’t always appreciate this until it’s too late. The sad state of a pickup dam in Melinajuganahalli is proof of this. The dam was built in Sir Mokshagundam Visvesvaraya or Sir M.V. in 1917 and is named after him. The dam is 8m tall and 55m long. Sir MV envisioned this as a catchment area that would store and provide water to Doddaballapur and the neighboring areas. This catchment area was spread over 10.5 sq.km. At the time of its construction, this dam boasted of the latest technology. It had automatic crush gates that controlled the level of water and kept it from overflowing. The water collected in this catchment area flowed towards the north Pennar river and finally into Andhra Pradesh. Today the area around the dam is strewn with food packets, empty bottles, and cigarette butts. Where once the water tasted sweet, now shepherds don’t even let their animals drink from here. The dam has not been maintained and silt is not removed on a regular basis. As a result, the water has become dirty and stagnant. The lack of public amenities such as toilets in the area has made the place stink. In addition, quarrying has been allowed in the area which has reduced green cover quite drastically. Water is also no longer being stored as it should. This also means that the groundwater levels have reduced. This was not the only dam constructed by Sir Mokshagundam Vishweshvaraya. Sir MV was the 19th Diwan of Mysore. He served between 1912 and 1919. Sir MV was a statesman, engineer, scholar and recipient of the Bharat Ratna in 1955. When it comes to dams, he is best known as the chief engineer of the Krishna Sagar dam in Mysore and the chief engineer of Hyderabad’s flood protection system. The dam designed by him to protect the Vishakhapatnam port was once the biggest reservoir in Asia. He designed a system of automatic water floodgates that were first used in 1903 for the Khadakvasla Reservoir near Pune. These gates were later also used in the Krishna Sagar dam and Gwalior’s Tigra dam.